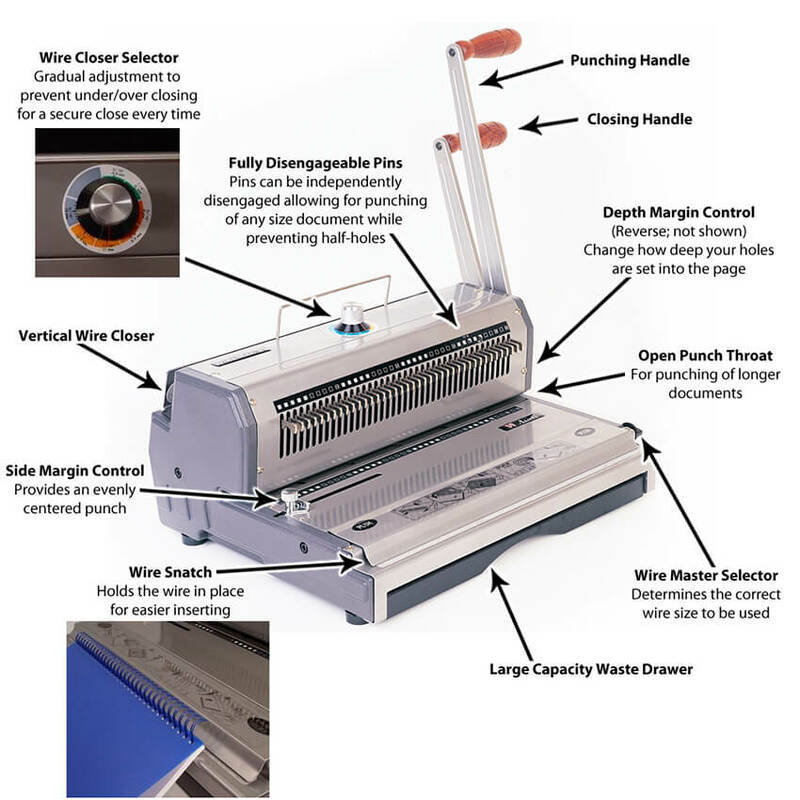 What is the Best Wire Binding Machine for Small Business? The WireMac-M wire document binding machine is simple, affordable, and incredibly sturdy for the price! It is out best selling wire binding machine overall, and is especially popular for small offices that may need to bind many books in one sitting, but not all the time. It works with standard twin loop Wire-O bindings, and can help you easily and quickly produce professionally bound wire notebooks from the comfort of your office. • Inexpensive - Retailing at less than $300, this wire binding machine is easily affordable by most office-level budgets. It can quickly pay for itself when you factor in the price you used to pay to outsource your book binding to print and bind shops, which can cost upwards of $15 per book. With only about 20 books bound in-house, this little powerhouse of a wire binder will start saving you money. • Durable - Made of mostly metal, the WireMac-M is quite a step above other machines in the same price range that are made of flimsy plastic. The handle is made of metal and wood as well, which makes it comfortable to hold, and sturdy to pull. • Very Functional - This small office wire binding machine has all of the alignment guides you need to set up your paper and get it nice and straight. It also has additional features, such as a depth guide, so you can even choose how far into the page you want your holes to punch. Plus, it has completely disengageable punching pins, which means you can stop the machine from punching any of the individual holes; this opens up the door to nearly any page size and eliminates any possibility of getting those annoying half-holes on the ends. The wire closer is easily adjustable to the size of wire you are using, which ensures a nice round finish. It also has a 14" binding edge with an open-end and hole alignment peg, which means you can even do up to a 28" edge by just punching once, flipping the stack, and punching again. • Wire Clasp - This simple feature lets you hold the wire in place while you put your pages on, so you don't have to fumble with both at the same time. • Easy - The WireMac-M is easy enough to use. Just place your pages into the feed and set your paper guides to line up your holes. Pull any pins you do not want to punch, and then pull the punch handle. Continue this for your entire book, punching small groups of sheets at a time. Then hang the wire into the clasp and place your pages onto it. Grab your book and place it, wire-side down, into the wire closer on the back. Make sure the closer is set to the wire size you're using, and then pull the closing handle to crimp your wire around your pages. In just a few minutes, you have a completed and professionally-bound wire document. • Pretty Powerful - For a small-office binding punch, the capacity is pretty impressive; it can punch up to about 20 sheets of paper at one time. Most machines in this price range can only do 10-15. Remember that punching at full capacity 100% of the time would be like driving your car as fast as it can go 100% of the time; it is the maximum punch, but slightly less is recommended to keep it running perfectly and not wear out the machine. • Fairly Compact - The WireMac isn't the smallest machine in it's class, but for the value of the functionalist and durability, the slightly larger footprint is worth it to most users. It measures 16" x 16.5" x 16" and weighs about 40 lbs. Typically users will give it a dedicated table where they can store paper and wire binding supplies, as well as not feel too crowded. Most users will leave it out at all times, rather than try to store it away between uses. For a machine that is easily stored, consider the iWire instead, which is one of out top-selling wire binding machines for home offices.